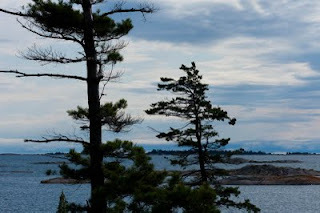 I was out on an island in Georgian Bay over this past weekend. I'm told that winds surpass 146km an hour in the winter, and the pines with their leaning shapes and bended brances attest to this. 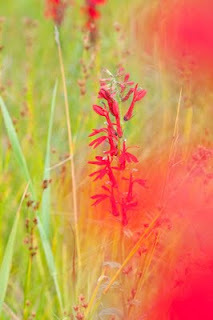 Lobelia Cardinalis was in full bloom - brilliant red against green grasses and blue water. Now, Marilyn, those winds aren't usual! But there is Lake Effect precipitation much of the year. Climate Change has certainly make it a more extreme seasonal 'normal' pattern, but the days are glorious. Glad you enjoyed visiting My Muskoka !